Developing their child's love of reading and books. By praising, celebrating and recognising achievements, parents can make their child's journey to becoming a reader much, much more enjoyable. Your child’s books will be changed weekly (although they can keep them for longer for this if they wish). 1. 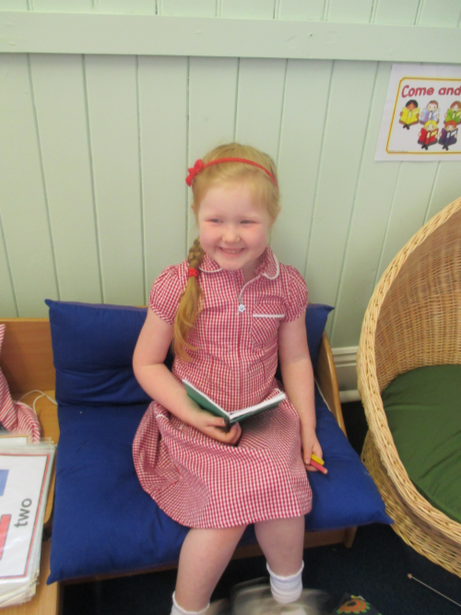 ‘I can’ book from the RWI phonics programme (labelled ‘I can… read this confidently’). Your child will already have read this at school and will have been taught all the sounds that make up the words in the book. They should be able to read MOST words without any help. This book does have some structured activities inside it that you could do with your child before and after they have read it. We want this book to be a way of ‘showing off’ their reading skills to you. We are asking parents to give LOTS of praise and encouragement when they can read it confidently. They can read this book to themselves at bedtime, you or another relative or even to a cuddly toy! There is no need to record this book in the Reading Record book as we will record this at school. 2. ‘We can’ book from the coloured book banded scheme (labelled ‘We Can…read this book together’). This book is closely matched to your child’s current reading level but they will not have been taught all the sounds in all the words in the book. They will not be successful in reading this without your help. This book can be changed every week although it is always a good idea to read the book more than once before returning it. Your child should try to read some/all of the book but you will need to help them. This is not cheating! This book is extra reading practice so that your child can have experience of even more stories and learn more vocabulary. If they come across a tricky word, please don’t ask them to sound it out….you can tell them the word, ask them to say it too, and then talk about what the word means. You might read the book to your child once before you try to read the book together with your child joining in where they can. You could take turns to read a page each or your child might just join in with words and phrases that are repeated. This book should be recorded in the Reading Record and signed before returning to school. 3. A library book. This book is completely your child’s free choice from our school library. Your child may choose stories, information books, puzzles and plays. We hope that this book will encourage your child to get into the habit of reading a book for enjoyment’s sake. They might just want the book for the illustrations or the photographs in it. That’s OK……you could just spend some time talking about the pictures! This is a book that you can read for your child entirely. Just as long as you both enjoy it……..
We have lots of children, mainly in Years 3 and 4, who have already reached the end of the RWI programme and who are now using RWI spelling. We still want to encourage them to read widely, however. These children will be able to borrow longer fiction and non-fiction titles from the school library on a regular basis and we will check reading records to ensure that every child is reading. These can include a child’s own comment about their reading, their favourite character, etc – it doesn’t always have to be a comment from a family member. We are going to monitor these weekly and respond to any comments. We have just begun the exciting journey of teaching the children to read and they won’t have an ‘I can’ or ‘We can’ book in their book bags...yet! However we want them to love reading and sharing stories so children can take books from the library every week and...coming soon, we will have Story Sacks! These are drawstring bags with the book, related toys and activities inside.